The lute was played in Europe for over 500 years and, for some of that time, was the most important musical instrument in European culture. The ancestor of the European lute is the north African and middle eastern musical instrument, the ud, (also spelled oud). The ud resembles the European lute and has four pairs of strings which are played with a plectrum. Obvious visual differences are the ud's curved pegbox and the presence of more than one rose. In Arabic 'al ud' means 'the wood' and this has given our language the word 'lute'. The ud has existed for over a thousand years and is still played today. 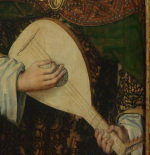 A five course lute being played with a plectrum from a c. 1500 painting in The Louvre. Whether due to invasion or commerce, the ud was known in Europe by 1000 AD. Here, the ud was adapted to local needs and paintings from the 15th century show instruments, which are definitely lutes, with five courses (a course is a pair of strings played together, or a single string) being played with a plectrum. No lutes survive from this period but there is an interesting manuscript from about 1450 which loosely describes lute construction (Arnault's manuscript). In Europe, the size, shape, stringing, and tuning of the lute would continue to evolve as the musical styles changed and as new technology became available. 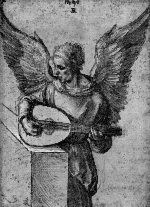 In 1497, Albrecht Durer depicts an angel playing a 6 course lute, plucking the strings with fingers. The middle Renaissance (1500-1580) lute had six courses, the top string often being single. The use of a plectrum facilitated the playing of single highly ornamented lines of melody. This style can still be heard in modern ud music. 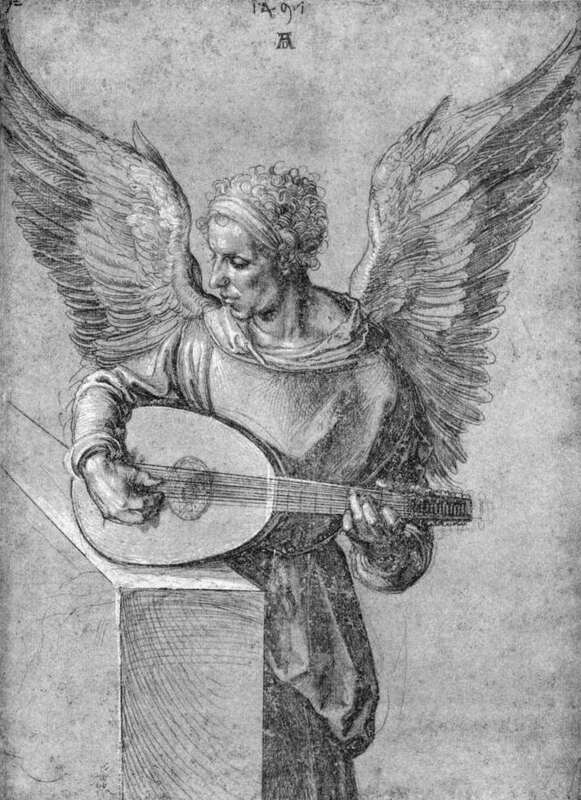 The new Renaissance trend to play more than one line of music at a time (polyphony) was not easily accommodated with the plectrum and the technique of plucking with fingers evolved. At about this time a form of music notation for the lute appeared, known as tablature, which gives the positions of the fingers on the fingerboard as a guide to the music. This century saw the beginning of published lute music with music books and tutors being printed all over Europe. Woodworkers with German names such as Frei, Mahler, and Unverdorben had workshops in northern Italian cities and produced lutes typically with six courses and pear shaped bodies made of nine or eleven hardwood ribs. A few instruments of this period survive. The workshops were good sized and long lived, often family businesses, and produced many thousands of lutes. As better bass strings became available, lute makers began to produce lutes with seven courses. The first mention of a seven course lute is in 1511 and the first published music for the instrument began to appear around 1580. These new strings, known as catlines, probably used rope technology to twist the gut to increase flexibility and thus their ability to play lower notes. It is possible that the strings were also treated chemically to increase their density. The seven course lute was slow to appear in England. The late Renaissance (1580-1620) is a particularly interesting time for the lute. It was well established as an instrument of the court and was studied by many prosperous citizens. The student of the lute needed to be sufficiently affluent to afford the instrument, music, strings and tuition. Its main uses were as a solo instrument or to accompany voice but it was also used in ensembles, known as consorts. John Dowland, perhaps the finest lute virtuoso, played and published his music in England and on the continent during this time. Many cities supported lute making workshops and some lute makers were, to judge by their tax records, comfortably well off. The outline of the lute body in the late Renaissance was not elongated, as were the earlier lutes, but more rounded. The number of ribs used to make the body increased, at first to thirteen or fifteen, then twenty-five and later to more than thirty, and occasionally to over fifty. Quite a few instruments of this period survive and some are exquisitely crafted. Most of the surviving multi-rib lutes are made of yew. The yew longbow had become obsolete stocks of the wood held for military use may have become available to musical instrument makers. Once the seven course lute was established, lutes with eight, nine and ten courses appeared relatively quickly. Although these lutes might have nearly twenty strings, the playing of them was sensibly organised. Only the first six courses were stopped and the relative tuning of these strings was not far removed from that of the modern guitar. Courses seven to ten were not usually stopped and had their pitch altered, if necessary, to the accidentals of the key being played. The actual pitch of the strings was determined by the first course of a single string which was tuned as high as possible without breaking. The remainder of the strings were tuned to it. However the intervals between courses were the same as the modern tuning of g' - d' - a - f - c - G. A seventh course would be tuned to D or F.
This tuning was the standard until the the mid 17th century when new tunings evolved for the first six courses of the lute. A new string technology, the winding of wire over gut strings to make overspun strings, allowed experimentation in lute design. Towards the end of the 17th century, new lutes had eleven courses (sometimes thirteen or fourteen) with the first two courses strung singly. The top six courses were often tuned to a minor chord, f' - d' - a - f - d - A, the D minor tuning. Full use was made of overspun strings for the basses, and with an increased string length, the instrument had a very different tone and compass when compared to earlier instruments. The bodies of these instruments took their shapes from both the elongated and rounded lute bodies. Many older instruments were altered to carry more strings of the new longer string length. Those instruments made by the early Renaissance makers were especially prized for this purpose. As this lute was played during the Baroque period it is known as the Baroque lute. Thirteen course lutes appeared in several variations. One version was a modified eleven course lute, with a rider to carry courses twelve and thirteen. The rider was attached to bass side of the pegbox, held four pegs and a short nut for the two courses. Another type of thirteen course lute had two pegboxes, neither bent at a sharp angle to the neck, but attached in line with the neck, one after the other, making a very long instrument. These instruments are often called theorboes, but are in fact are thirteen course lutes using a different constructional solution to the problem of so many strings. There was a large variety of sizes and shapes of lutes. The most common size was, and is, often called the mean lute. Higher pitched instruments were known as treble lutes, while larger, lower pitched instruments were bass lutes. 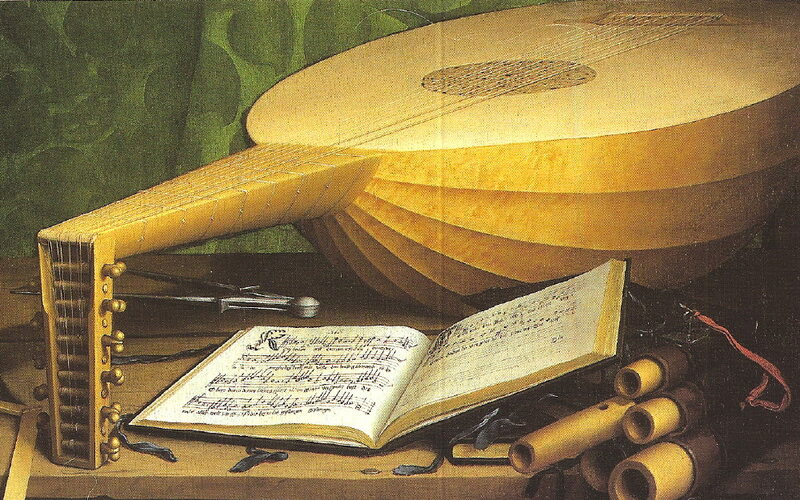 A family of lutes with two pegboxes appeared in the late sixteenth century. They initially developed from bass lutes and showed a variety of pegbox positions and neck lengths. Known as the theorbo and chitarrone, they were used to accompany voice and in ensemble. They outlived the mean lute and were used for bass continuo well into the eighteenth century. They are all fascinating shapes, some with very long necks indeed and sometimes made by re-necking old lute bodies. For nearly five hundred years the lute was played in the cities of Europe. It was the most respected of all musical instruments. In western musical history there is not another instrument to equal its combined longevity and stature. The reasons for decline of the lute are not easy to document. Certainly the appearance of larger, and therefore louder, orchestras and an increasing reliance on keyboard instruments such as the harpsichord and piano, both reduced the demand for lutes and lute players. J. S. Bach, who died in 1750, composed some of the last music for solo lute. The professional lute players who retired during the time of Mozart and Haydn were not replaced. The tradition of lute making entirely disappeared. No old workshops, plans or lute making tools survive. All the information known today about lutes has painstakingly won by research. What did survive in quantity and of excellent quality, was the music. For all twentieth century lute makers, the sources of information about the old lutes are limited; paintings, the surviving lutes, the music and a handful of contemporary tutors. Paintings and drawings are only sometimes accurate, but used with care they have provided considerable information about stringing, shapes, sizes, materials and chronology. The surviving instruments are both rare and precious. From northern Italy around 1600 there are about twenty good examples of seven and eight course lutes. Each one has been altered, damaged, or is an unusual size and none can be copied as it now exists for modern use. But together they give a good insight into lute making of the time. From 1550 and earlier there are two, perhaps three, informative lutes remaining. The oldest surviving lutes are the often modified lute bodies by Frei, Mahler, Unverdorben etc. Some of these may date as far back as 1520, but very few original soundboards have survived. The music can also provides clues. Besides giving immediate information on the stringing of the instrument, if the lute is not made properly it becomes difficult, and sometimes impossible to play the music. There has also been confusion and misinformation. Consider the modern lute maker attempting to analyse an authentic Renaissance lute which had been altered by an eighteenth century craftsman to play Baroque music. There were German guitar makers in the 1920's making massive lutes which owed most of their construction to the modern guitar. There are folk instruments which are like a cross between a lute and a guitar. Both of these have been, at times, confused with authentic old lutes. There were forgeries in museums and careless modern restorations of old instruments which caused valuable information to be lost. In the early years of this century Arnold Dolmetsch became interested in the lute and managed to play at least one old instrument by Michael Harton. Although it is said that Dolmetsch made a modern reproduction lute (and recorded with it), he would have found research difficult. In early publications of the American Lute Society, Suzanne Bloch wrote of her experiences in the 1910's and 1920's in Germany, tracking down the lute and lute music, and meeting Arnold Dolmetsch and Diana Poulton. The Lute Society in England was founded in 1956 and the decade following saw a great interest in what became known as 'Early Music'. Interest in the old instruments followed closely behind. Initially, the modern lutes showed a lack of historical research, but slowly the information was rooted out from the centuries. In Germany, Friedman Hellwig was in charge of musical instruments in museums and began to measure, document and publish plans. His articles about lutes, makers and construction practice broke new ground. Especially important for modern makers was his description of the geometrical barring patterns used by old makers. Old musical instruments, including lutes, began to be x-rayed. In the England, the Fellowship of Makers and Researchers of Historical Musical Instruments, founded in 1975, provided a forum for discussing accurate historical information. Ephraim Segerman, sometime editor of the FoMRHI quarterly and founder of Northern Renaissance Instruments, has been indefatigable in the search for historical accuracy in reconstructing the old instruments. Lute makers Michael Lowe in Oxford, and Stephen Gottlieb and Steven Barber in London, produced some of the earliest acceptable modern lutes. It became possible, for the first time in two hundred years, to receive full time training to become a lute maker. In the U.S.A., the American Lute Society and the Guild of American Luthiers cater to the needs of players and makers. Robert Lundberg has written an important series of articles on lute making for the magazine published by the Guild of American Luthiers and these articles are now available as a book. The revival is not over nor is it static. There is presently plenty of discussion over the merits of gut, nylon, carbon fibre, coated gut, brass wound and copper wound strings. The lute, and early music, have become established as part of classical music. It is due to the scholarship, musicianship and dedication of musicologists, lute makers and musicians that the lute and its music is heard again.